If you're one of the roughly three million Americans with celiac disease (CD), you know that negotiating the holidays can be hard. Whether it be eating out more frequently or meals with family, ingesting even a small amount of gluten can cause serious pain and even intestinal damage. So what are you supposed to do to make sure that this Thanksgiving will be pain-free without hurting anyone’s feelings? Unfortunately this tends to be one of the first things people do: Instead of dealing with all the food restrictions, they avoid any event that could present conflicts. While avoidance may work here and there, it’s not a great strategy for going through life with CD, because so much of life is centered around food. If you are not part of a celiac-aware family, you might need to cook the Thanksgiving meal yourself. If others want to bring something, ask them to bring non-food items or things like soda or tea. Should the occasional gluten-laden gift treat make it to the table, label what’s what or move dishes with gluten to a different area. Be sure to set out serving utensils for every dish to prevent cross-contamination. Talking with the hosts can be one of the most challenging aspects for many people with CD. We don’t want to offend anyone but neither do we want to end up sick. It’s important to tell the hostess about your restrictions, and how seriously you have to avoid gluten. They need to be aware that CD is an autoimmune condition, NOT just a food preference. Beyond Celiac and the Celiac Disease Foundation have tons of resources you can print out and share with your family or hosts. Even then, the hosts may not understand that you won’t be able to eat a gluten-free item that they made in their gluten-containing kitchen. So be sure to make that clear if it's an issue for you. If you let people know these things ahead of time, it can help avoid hurt feelings when you have to turn away that special dish later. It also may help you and the hosts come up with a shared plan for avoiding discomfort and maximizing joy. For the above reasons, a lot of people with CD may choose to bring a few GF dishes of their own, to make sure they will be able to eat something. I know one friend who makes her own plate of food at home and heats it up when she gets to the dinner, although this isn’t always practical. Again, be sure to label GF foods, set them away from the regular foods and provide serving utensils that won’t be used in any other dish. It also may be helpful to pick up a few sides or pies from a gluten-free bakery so that you won’t have to cook and bake all day just to attend a dinner. Remember, there are always going to be food mistakes, because people are not perfect. Be sure to adjust your mindset accordingly. 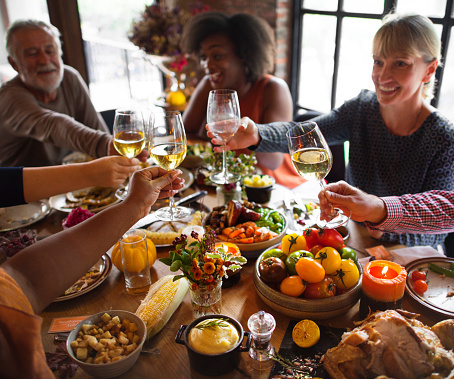 As long as you can take comments about food restrictions in stride and avoid getting too worked up about missing your favorite dish, the day can still be fun. Try to concentrate on spending time with your loved ones and making non-food memories, like long walks after Thanksgiving dinner, football in the yard, or card games in the house with your grandparents. Whatever the traditions may be, just remember that family is what the holiday should be about! Negotiating any food holiday with CD can tough, but with a few tweaks here and there and the right attitude, you can still have a fantastic time.